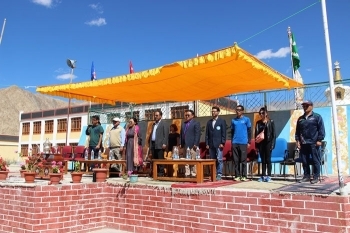 Annual sports meet themed ‘Padho Lamdon, Khelo Lamdon' was held at Lamdon School on August 29. Confluence of champions in different sports including Tsering Tashi, Dist. youth officer, Sonam Tamchos the youngest person in India to go to North and South Pole, Skalzang Wangyal, Referee IIAF, Stanzin Laskit and Rigzin Dolker who successfully escalated Mount Everest, marathon champions, Jigmet Dolma and Nawang Tsering graced the occasion along with alumnus of Lamdon school. New Lamdon sports scademy was also inaugurated. Stanzin Dawa, Principal said that the purpose of the academy is to promote sportsmen spirit among the students which will lead to the physical fitness. Konchok Angmo, Principal, DIET, Phuntsog Angchuk, President, Lamdon Social Welfare Society, Tsewang Paljor, President Managing Committee, Tsewang Norboo, Former President, Lamdon Social Welfare Society congratulated school for the great initiative. Students of various houses showcased splendid march past along with aerobic and various dance program. Prizes were also distributed among the winners of Lamdon Marathon. Friendly volleyball and basketball match was also played between Lamdon, CIBS and TCV School.